Chris Andrus aka Soul & Blues Recording Artist Lil' Fallay (pronounced Fall- Lay)has changed the landscape of soul music in South Louisiana and the Chittlin Circuit music genre. After working as a firefighter for 17 years, he decided to pursue his love of music. He appeared on the scene in 2001 with his debut album DREAMS DO COME TRUE with the break out hit “Swing It” , selling over 6,000 copies as an Indie Artist ! Performing on the same stage with the likes of the late great Tyrone Davis, blues legends Bobby Blue Bland, Michael Cooper of Con Funk Shun, Zapp, The Manhathans and Southern Soul Headliners, Mel Waiters, Denise Lasalle and Willie Clayton increased his exposure. 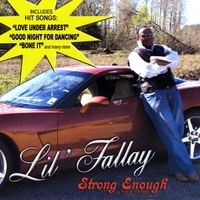 In 2002, Fallay released his follow up album entitled TASTE ME. Although DJ’s across the country lauded it a success, as a result of 9/11 and the “freeze” it caused on American travel and merchandising, the CD did not receive the same exposure or sales as it predecessor. Without skipping a beat, he teamed up with Charles Manns, a veteran of the great Philadelphia International , who produced his third project, 2003’s BACK 2 BASICS which included the unforgettable mother's day tribute song entitled “A Mother's Love”. Also, in 2003, he released the patriotic “PROUD OF OUR TROOPS” which received international attention. Always a trailblazer, in 2004 he released the first Southern Soul concept music video entitled “CAN I DANCE WITH YOU” which featured “swing out” , a dance that originated in southwest Louisiana . Filmed in the oldest juke joint club ( The Willow) in Lafayette Louisiana , the video has been broadcast in New York , Mississippi , Texas and Louisiana . The next project, 2005’s FOLLOW MY LEAD was heralded as his best project to date which brought him to throne, where he sits as THE “SWING OUT” GURU, a name given to him by a review writer, which was dubbed around the world. Subsequently he released JUST FOR THE LADIES in 2007 and his most recent release STRONG ENOUGH, in March 2009, from which Fallay received his first nomination as Southern Soul’s “Best Male Vocalist”. Several tracks “Love Under Arrest”, “Bone It Like You Own It” “Good Night for Dancing” and “Be Honest” are all concurrently climbing the charts! This has resulted in Fallay getting more national exposure than he has in his nine years in the music industry, using gorilla styled independent marketing and having the ability to get back up and keep going in a difficult industry, Fallay has definitely reached that place where his reputation and his music is synonymous with the name of the management company that has produced him for over 9 years . . . . Hot Like “Fire” !!!! Hey ya'll I have been listening to this man sing since I was three years old..and he has only gotten stronge and stronger. Which is more than fitting for the new cd to be called Strong Enough A True Story. I love this cd if you do not have it you have to go and add this to your music collection. This is a five star cd grown and sexxy music. Chris Andrus aka Lil Fallay aka The Swing Out Guru continued successful, continued happiness, and continue to use your God given talents to recieve your God given blessing!! GO BUY THIS CD YALL ITS THE BOMB!!!!! !